BINGO - the comment there proved it a hoax. 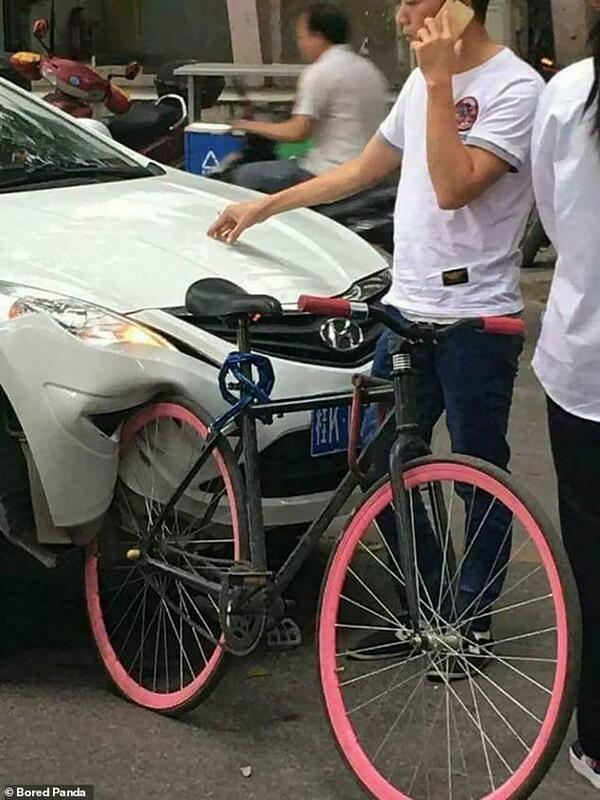 The traction of the bicycle wheel would not be enough to overpower the construction of the car. It would simply push it forward or even lift it off of the ground. Do you note that not only is it a different bike but it has flat rims. Al's picture shows a Fixy and not only that but no brakes at all and no one could stand on the pedals with a push like that. Also the car is completely different. Which is why I said I found a "VERY SIMILAR" image. Emphasizing "very similar". than some bicycle wheels in some crashes. Consider Andrew, there is no possible way a bicycle tire has sufficient traction to do this. The total amount of traction of the tire has to be measure in ft/lbs of energy. Even a paper mache front end could exceed that. Consider Andrew, there is no possible way a bicycle tire has sufficient traction to do this. The total amount of traction of the tire has to be measure in ft/lbs of energy. Tom, those units of measurement don't make sense. ft/lbs/sec if you have to have your hand held. mass times the square of the speed. (or kiloNewtons). In the U.S., the appropriate unit would be pounds. I"m willing to listen to ideas. something like velocity/force. It makes no sense in relation to "traction."